Ávila de los Caballeros (Latin: Abila and Óbila) is the capital of the province of the same name, now part of the autonomous community of Castile and León, Spain. Ávila was the birthplace of the 4th-century theologian Priscillian, the first Christian to be executed for heresy. The town is more renowned for St. Teresa of Ávila, the Carmelite reformer who lived there twelve centuries later (c. 1515-1582). 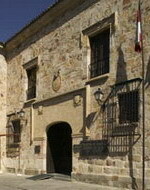 A convent and church mark the supposed birthplace of Santa Teresa, but she was born in Gotarrendura in the Ávila province. Other prominent natives include Saint John of the Cross, Tomás Luis de Victoria and the Spanish-born American philosopher George Santayana. From 1482 to 1807 it was also the seat of a university. Ávila is most known for the medieval city walls, that were constructed of brown granite in 1090: surmounted by a breastwork, with eighty-eight towers and nine gateways, they are still in excellent repair, but a large part of the city lies beyond their perimeter. The Gothic cathedral is integrated into the city's defences. It was built between the 12th and 14th centuries, and has the appearance of a fortress, with embattled walls and two solid towers. It contains many interesting sculptures and paintings, besides one especially fine silver pyx, the work of Juán de Arfe, dating from 1571. In the historic quarter of the sizeable town of Ávila, this Parador is installed within the former "Piedras Albas" Palace, backing onto the impressive city walls. In keeping with its surroundings, the hotel's interior has a warm and intimate feel creating a very refreshing atmosphere, enriching your time spent there. Its beautiful decorative features include granite and adobe floors, bright colours and spacious rooms, some with four poster beds. These features all combine to create a light feel to the rooms. The Parador also features a garden containing archaeological remains, a magnificent glass-roofed courtyard, partitionable function rooms and a cafeteria. 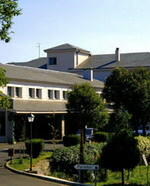 The hotel's restaurant provides a beautiful view over the gardens and the city walls. Navarredonda de Gredos is a municipality located in the province of Ávila, Castile and León, Spain. According to the 2006 census (INE), the municipality has a population of 469 inhabitants. 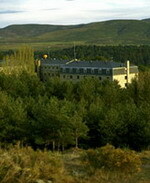 The Sierra de Gredos has housed this stone building since 1928, the first Parador, surrounded by crystalline waters, rough rocks and green pine forests. The location in Alto del Risquillo is a privileged vantage point over the Valle del Tormes, the Gredos massif and the Piedrahita and Béjar sierras, making it a real excursion centre. 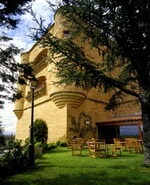 The hotel’s tough stone walls hide an interior with standout comfortable rooms, some with terrace. Classical wood reigns in the dining room, library and lounges. The presence of granite columns and the furnishing provide the space with a traditional Castilian style. The quality of the meat and local vegetables and pulses - such as the famed Barco beans - make for a rich cuisine of roasts and comfort soups and stews. Burgos - at the edge of the central plateau, Burgos has about 170,000 inhabitants in the city proper and another 10,000 in its suburbs. It is the capital of the province of Burgos. Worth visiting - the Gothic Cathedral at Burgos, begun in 1221, displays features of the 13th to 15th centuries. Also visit the Royal Monastery - Monasterio de las Huelgas - and Monasterio de Miraflores. Lerma - 36 kms from Burgos, and 199 kms from Madrid. León - located in a flat countryside with wonderful historical and architectural heritage. One of Leon's glories is without doubt, the Cathedral, one of the finest in Europe and having been constructed from the 13th century for a period of 200 years to completion. It has more than 250 remarkable stained glass windows including a large rose window. In total there is over 1800 square metres of glass. The cathedral museum is also worthy of a visit with its wide array of exhibits. 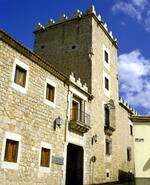 The Collegiate Church of San Isidoro houses an impressive collection of early manuscripts. An early Romanesque construction. 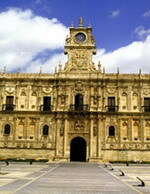 The Palacio de los Guzmanes is a magnificent 16th century building with an impressive courtyard. The Casa de Botines is an impressive piece by Gaudí with large turrets on each corner. The Town Walls are of Roman and Medieval construction and are very impressive. The San Isidro Tower is of particular interest. The San Marcos Monastery, whose construction began in the 16th century, replaced another 12th century monastery from the times of King Alfonso VI. There are suites located in the original building with views of the square and also an annex constructed in the 20th century where the majority of the accommodation is housed. Regal halls, spacious rooms, a library and a restaurant which in the main part offers an impeccable traditional gastronomy with touches of signature cuisine; all of which makes the Parador de San Marcos a unique establishment on St. James’s Way and the Silver Way. Discover Leonese gastronomy in the Rey Don Sancho restaurant. Saturate yourself with the finest flavours of this historically plagued land enjoying the traditional local food washed down with the excellent D.O. Bierzo and C.O. 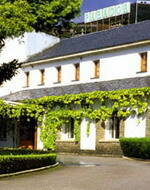 Tierras de León wines. Salamanca - Salamanca is probably best known for having the oldest university in Spain and one of the oldest in Europe. This university is still what gives ambiance to the town. This charming town is untouched in it's architectural purity. In central areas all recent buildings are constructed in Salamanca's best tradition. The city has been declared "World Heritage Site" by UNESCO. The city lies on a plateau by the Tormes river, which is crossed by a bridge 500 ft long built on 26 arches, fifteen of which are of Roman origin, while the remainder date from the 16th century. Ciudad Rodrigo - located on the River Agueda, 89 kms from Salamanca and 28 kms from Portugal, with wonderful surrounding scenery. Tordesillas - a village in the Valladolid province of Spain. It was the site where the most famous Treaty of Tordesillas was concluded on 7 July, 1494 between Spain and Portugal that divided the globe between the two kingdoms for purposes of colonisation under the terra nullius-principle. The Main Square (see right) is also the main place in Tordesillas, in which the public activities have bean developed through the ages: markets, Middles Ages Games, bullfights, concerts, comedies, meetings. Many monuments and churches to be visited. Villafranca del Bierzo - the last stage on the pilgrimage route in El Bierzo before reaching Galicia. The settlement was developed from the pilgrimages. The river Burbia flows through the town. Wonderful mountain landscapes all around. 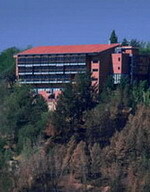 This hotel can be found in the extreme north of the Region of Castille-Leon in Villafranca del Bierzo, capital of a very beautiful region and former station on the road to Santiago. 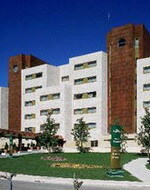 The rooms are situated on two floors of the main part of the hotel. The wooden floor in the bedrooms and elsewhere offers elegance and comfort. The cuisine typical of the town has its own specialities such as; Trucha Con Unto (a trout dish), El Botillo del Bierzo, El Pulpo a Barciana (an octopus dish) and Chanfaina barciana (a stew-like meal). For dessert there are Los Suspiros De Monje (a mixture of flour, sugar and egg). The landscapes of the Ancares mountain range to the north complement the beauty of the Parador's garden. Benavente - A prominent town located north of the capital on an important communications hub. 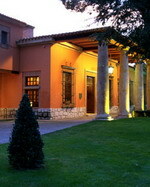 The most representative building in town is the Parador de Turismo Fernando II hotel, which occupies the Caracol Tower, a 16th-century castle with wide segmental miradors and a beautiful Mudejar coffered ceiling in the main section; although it also has other attractions for the visitor, such as the church of Santa María de Azogue, outstanding in which are the doors, some multicoloured Gothic sculptures and several pillars; San Juan del Mercado, with its prominent southern door; and the hospital of La Piedad, an old pilgrims' hostel. 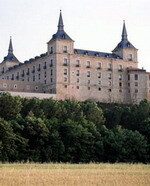 This renaissance castle was constructed under the order of Fernando II of León and was the seat of las Cortes in 1202. It makes up part of the old town, set within the town's ancient city walls. Surrounded by beautiful gardens, the castle's interior has classical decorative features such as tapestries, forged lamps, coffered ceilings, as well as Spanish bricks and woods. Its spectacular rooms are specially equipped to be an ideal location for social gatherings. The sleep-inducing bedrooms are cosy and accommodating, and the restaurant offers local cuisine: Bacalao a la tranca (cod with boiled egg), arroz a la zamorana (rice and pork dish), dos y pingada (fried egg and bacon on bread) and tocino de cielo (custard caramel). Puebla de Sanabria - Lovely area with hiking and green tourism routes and a historical and monumental town, close to the Sanabria Lake. 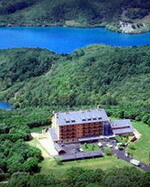 The Hotel is in an exceptional location just 12 km. from the wonderful Lake Sanabria, the biggest glacial lake in Spain. In the centre of the Sanabria area, on the frontier with Portugal, the Hotel is ideal for lovers of travel and nature, who come to the area for green tourism excursions and tours, which are a delight for the eyes and the spirit. The welcoming interiors, decorated with care, offer quality and comfort for a pleasant stay. The lounge, with its inviting fireplace, and some rooms offer large windows with views of the outstanding historic town of Puebla de Sanabria. In the restaurant you can enjoy exquisite habones (a local bean), trout and for dessert, a delicious blackberry cake. All accompanied by local wines in a relaxing ambience surrounded by nature. 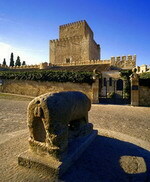 Zamora - a city in Castilla y Leon, and the capital of the province of Zamora. It lies in the northwest, near the frontier with Portugal and crossed by the Duero river. Many very beautiful medieval and Roman buildings, churches and places to visit.